Eschewing Hollywood's propensity for whitewashing roles of people of color, WGN America has ordered a live-action pilot of Vertigo Comics' 'Scalped' and reportedly will have an all Native American cast. DC Comics' mature imprint, Vertigo, released 'Scalped' in 2007 and ran for 60 thrilling issues. Written by Jason Aaron and illustrated by R.M. 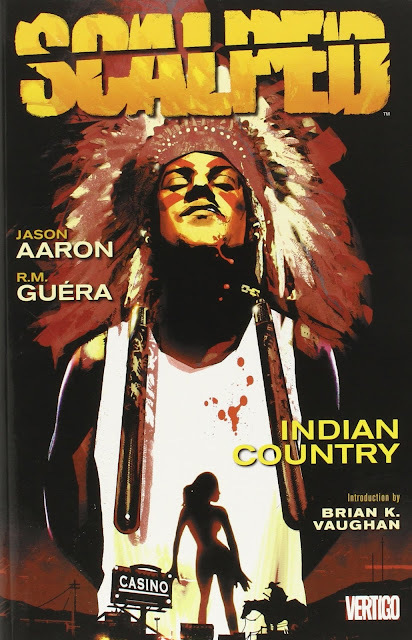 Guera, the gripping crime drama meshed organized crime with Native American culture. It was inspired in part by the 1975 arrest of Native American activist Leonard Peltier who was arrested for the killing of two FBI agents in a reservation shootout. Here's the original solicitation of the graphic novel that describes what the pilot will touch on. Fifteen years ago, Dashiell "Dash" Bad Horse ran away from a life of abject poverty and utter hopelessness on the Prairie Rose Indian Reservation searching for something better. Now he's come back home armed with nothing but a set of nunchucs, a hell-bent-for-leather attitude and one dark secret, to find nothing much has changed on "The Rez" — short of a glimmering new casino, and a once-proud people overcome by drugs and organized crime. Is he here to set things right or just get a piece of the action? DC Entertainment creative director Geoff Johns is attached to executive produce along with Doug Jung (Banshee) who'll write the pilot. 'Scalped' is the latest Vertigo title to head to television. It follows Constantine (NBC canceled last season after 13 episodes), Preacher (in production at AMC), and Lucifer (airing currently on Fox). That's not counting the other five DC Comics shows currently airing with a sixth, Powerless, on its way. It'll be the first half-hour comedy set within the DC universe. WGN America is attempting to shore up their original programming schedule by ordering the 'Scalped' pilot as well as another, Roadside Picnic, a sci-fi drama dealing with the aftermath of an alien visit to earth. The network's line-up already includes Salem, Outsiders, and the upcoming Underground. The critically acclaimed Manhattan was recently canceled. The network, if what "insiders" say if accurate, will give the characters the authenticity they deserve by casting Native Americans in Native American roles. It seems almost ludicrous to think they would do otherwise but as witnessed time and time again, Hollywood has a way of indulging in racial biases whether consciously or not. There's no need to celebrate WGN America for doing what they're supposed to do but in this day and age, not undermining diversity and representation has become the exception.